The beautiful Eco Botanics line of amenities, enriched with organic olive oil, brings a fresh feel to each guestroom. This collection features salon quality formulations that are gentle on the skin and hair. 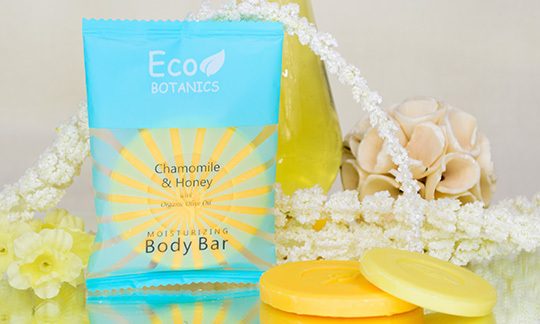 The moisturizing body bars and cleansing bars are vegetable based and have a refreshing chamomile and honey fragrance. All liquids and soaps are paraben free and gluten free. Eco Botanics, a part of the EcoWell Health and Wellbeing group, is a perfect earth-conscious choice.